Metallica’s ‘Through The Never’ hit cinemas late last week and doesn’t appear to have been pulling in the punters in any great numbers. Suprising when you consider the size of the crowds James, Lars, Kirk and Rob can draw when they grace the shores of any country in the world. 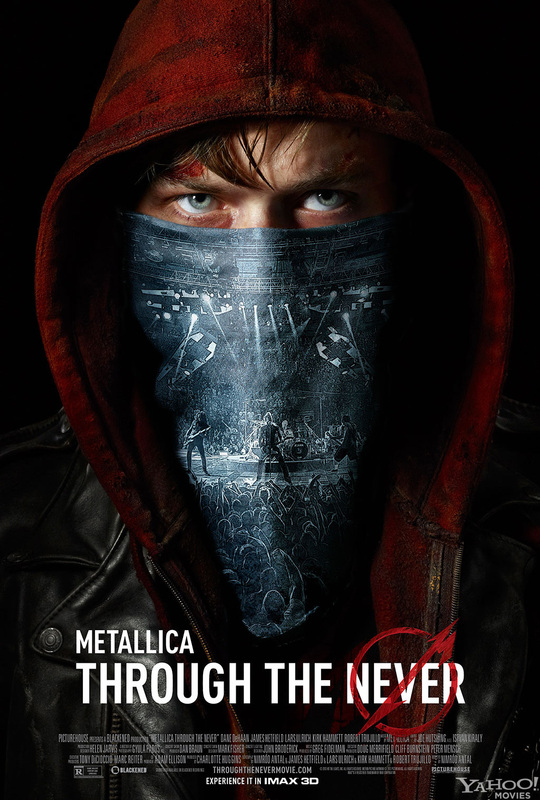 Despite this being a movie rather than live show, the experience is everything you’d expect from something with Metallica’s name stamped across it. Big, bad, bold and brilliant. Through The Never is a mash of Metallica playing an incredible career spanning live show that brings back beloved stage props, tour incidents and classic songs. From Kill ‘Em All to Death Magnetic – the boys bruise through sixteen of their crunchiest, heaviest, fastest songs while their young roadie/gofer treks through a war-torn city in search of materials badly needed by the band. The whole experience is presented in 3D, bringing the sweat from Lars back right onto your lap. The band sound incredible and each one casts an imposing figure on the screen – tearing through their set with extreme power. Add in a little humour and some incredible scenes featuring full on violence, death and anarchy – you’ve got Through The Never. If you haven’t been to an IMAX screening before then I can assure you it lives up to every expectation you could possibly have. The IMAX screen in Cineworld, Parnell St. is beyond impressive, imposing and makes adults feel like kids in the cinema again and if you haven’t seen Metallica on IMAX, then you need to sort that quick! It . Book tickets now! This entry was posted on October 8, 2013 at 5:00 pm and is filed under Film Review, Music, News with tags Cineworld, Dublin, Ireland, Metallica, Review, showings, Through the never. You can follow any responses to this entry through the RSS 2.0 feed. You can leave a response, or trackback from your own site. It’s a real shame it’s just IMAX – only one screen in the whole country which alienates a lot of fans. Welcome in Farmers Country. One fcukin Imax screen in the whole Ireland, that’s fcuking joke! What a country, way way back behind 21 century. It’s like IKEA. One fcukin shop in the whole green Ireland.